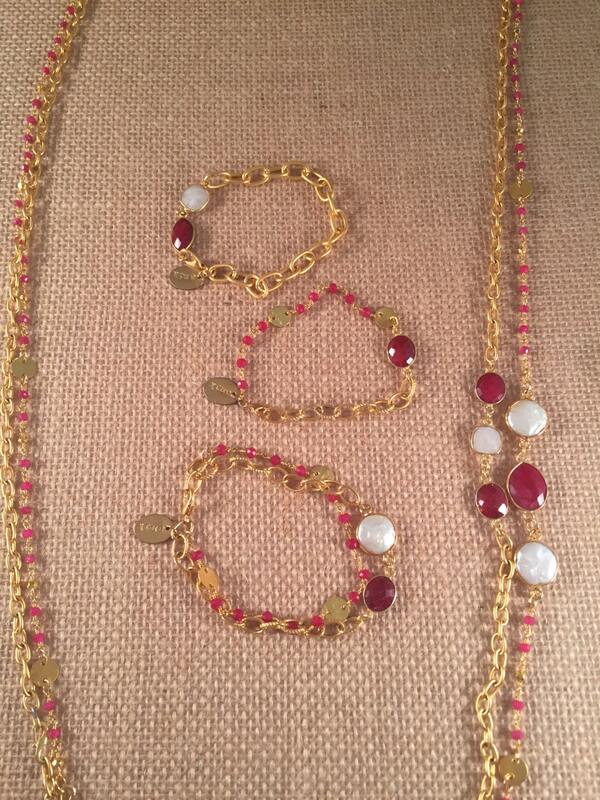 "GRANADA I " " GRANADA II" " GRANADA III"
WELCOME TO "ANIK SIGNATURE COLLECTION" MIX MATCH AND LAYER. THE "GRANADA I, II, III, BRACELETS" ARE PART OF THE COLLECTION OF BEAUTIFULL NECKLACES AND BRACELETS THAT GIVES YOU VERSATILE WAYS TO USE YOUR JEWELRY. YOU CAN COMBINE, MIX, MATCH AND LAYER ANY OF THIS PIECES TO CREATE YOUR OWN DESIGN. 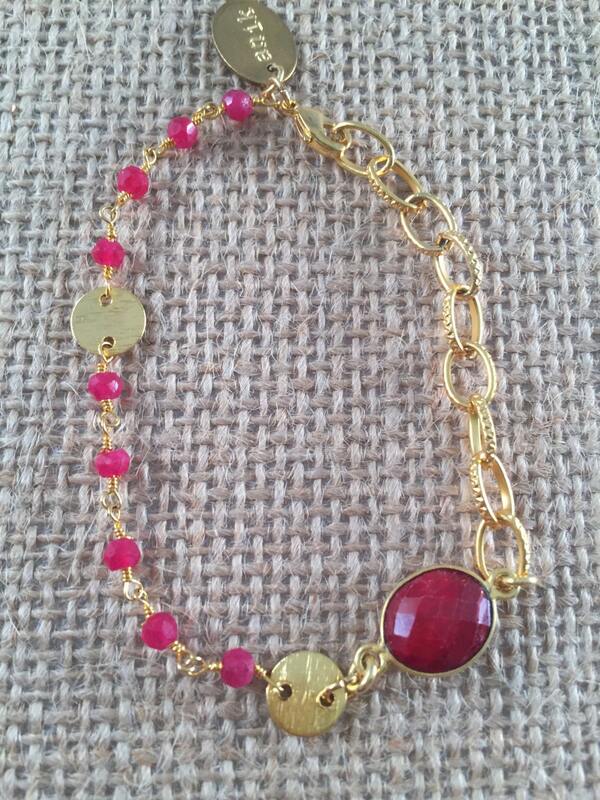 THIS BRACELETS ARE THE COMBINATION OF FINE TEXTURE, AMAZING COLOR AND BEAUTIFUL GEMSTONES. 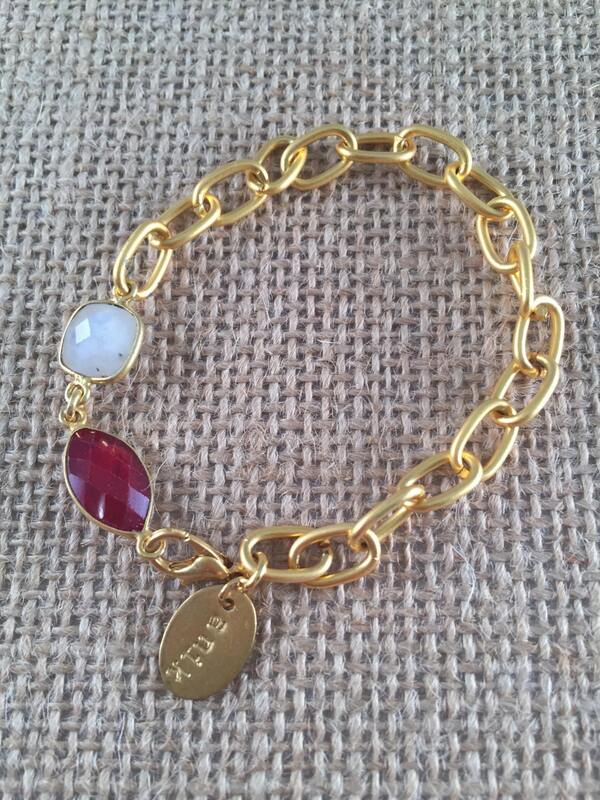 GRANADA 1 - Beautiful and Fine Texture Oval Gold Link Chain Bracelet with Gemstones, Dyed Ruby and Moonstone , Lobster Clasp, 22k Matte Gold Plated. 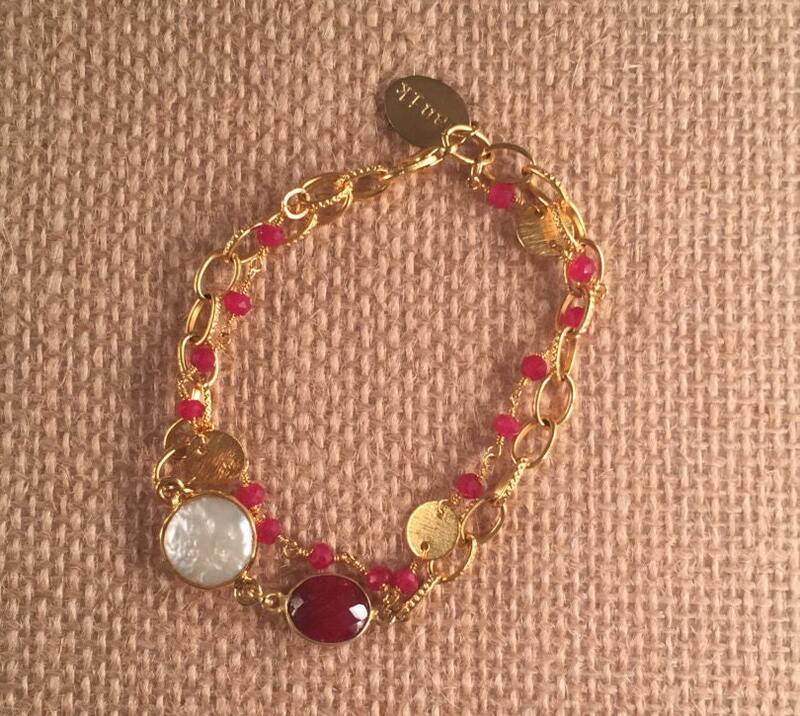 GRANADA II - Beautiful and Fine Texture Oval Gold Link Chain and Ruby Rosary type Beaded Bracelet with Dyed Ruby Stone, Lobster Clasp, 22k Matte Gold Plated. PLEASE SPECIFY WICH BRACELET MODEL YOU WANT TO PURCHASE, "GRANADA I, II OR III "
ALL THE NECKLACES FROM THE " ANIK SIGNATURE COLLECTION" HAVE A SPECIAL LITTLE CLASP THAT MATCHES UP WITH THE COLLECTION BRACELETS TO CREATE A DIFERENT AND OUTSTANDING WHOLE NEW LOOK. I KNOW YOU WILL ENJOY THIS BEAUTIFUL PIECE! 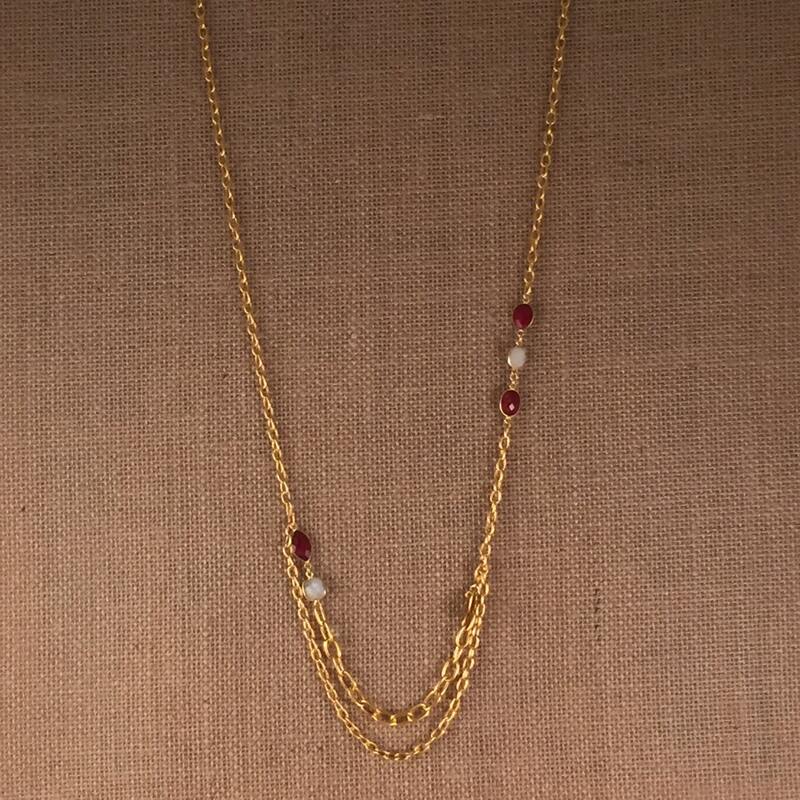 AND DON'T FORGET TO TAKE A LOOK AT OUR OUTSTANDING ANIK NECKLACES AND EARRINGS! EACH PIECE HAS A DELICATE ANIK TAG ATTACH. ALL OUR PIECES ARE SENT WITH A GEORGEOUS GIFT BOX SET!